This is kind of a tough one but it is time to shut down WorkoutJourney.com. I can tell you are equally saddened by the news. 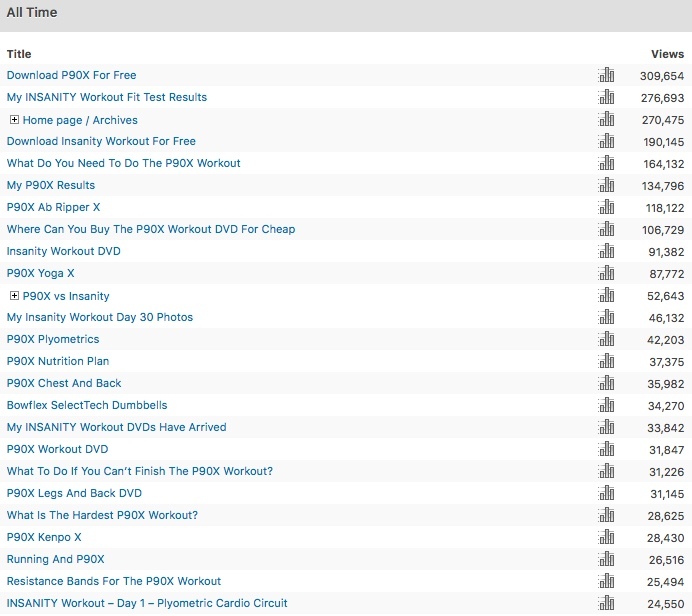 WorkoutJourney.com is by far my most successful blog. Its been responsible for 99% of my success as a Beachbody Coach. 2010 was big. Guessing there was 75,000 unique visitors who saw me with my shirt off in 2010. The bump in 2010 was probably due to what happened in July 2009. The Insanity workout was released. Posted my Insanity Workout Fit Test Results along with before and after photos. Kept writing about Insanity and P90X during that time. Beachbody spends a lot of money on advertising around January for New Years Resolutions. This continues till summer. This resulted in my most trafficked month in March 2010. In June 2010 something happened with the stats plugin or maybe even with my old website host Hostgator which caused it to not count visitors. Did not know it was going on for 3.5 months. Was an easy fix. Visitors would have been over 600k in 2011 if it was working. 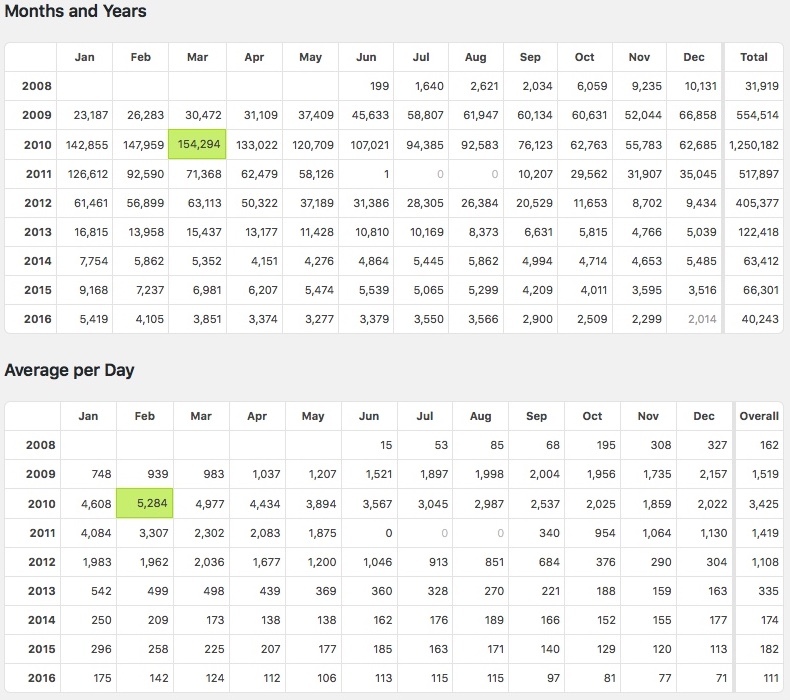 The Google Penguin Update in May 2012 hit me pretty good. Not really bad but enough to start the slow decline in traffic. 2012 to 2013 was a big drop. There could be some truth that traffic to my site declined with the amount of coaches in Beachbody growing 6 times to what it was when I signed up. Many created blogs of their own which spread out traffic. Can’t blame them. Its what some of the top coaches were doing. Its hard to rank for something when Google now has 500 of the same titled posts to choose from when it used to be 6. But I also slowed down on writing. In 2016 I wrote one post. 5 in 2015. 11 in 2014. 7 in 2013. 94 in 2012. And so on. Clearly there was no new content for Google to rank. Google gave me credit for all of my good stuff back in the day and kept it relevant. Otherwise it said since I wasn’t writing anything new it wasn’t giving to bump up the other not so great content. These are the top 35 of over 520 keyword phrases of all time. 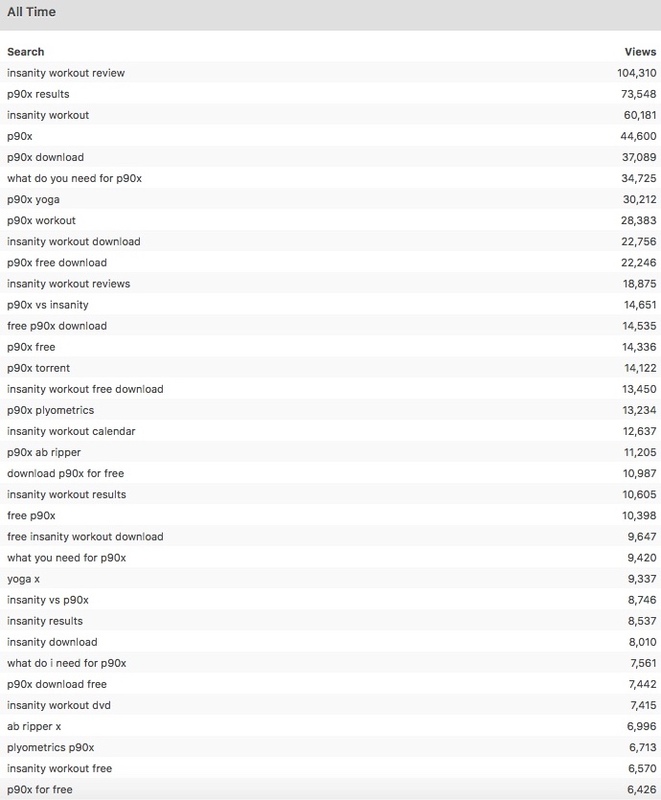 The stats tool tells me there are 32,351 unknown search terms. Crazy. Most of the keywords have P90X, Insanity, Body Beast, Beachbody, or the word review in it. There are quite a number of random keywords in the list. Here are three. You guess which one is the random one. That’s right. People typed Copperhead Snake into a search engine 424 times and found this post where I wrote how my buddy got bitten by one on a houseboat trip we were on. These are the Top 25 most viewed out of 444 posts. 25 through 40 all had over 10k views. 40 to 100 had over 1000 views. From 100 to 444 they probably saw 350 views a piece. Not gonna lie. Was being sneaky when I wrote the Download P90X For Free post in late 2009. It worked so well I did a “Download (workout) for free” post for most of the Beachbody workouts. On the post I’d say there was no place to download from Beachbody yet but they could get a free account to check out Beachbody hoping they might buy supplements like Shakeology. Home Page was #3 which is surprising. 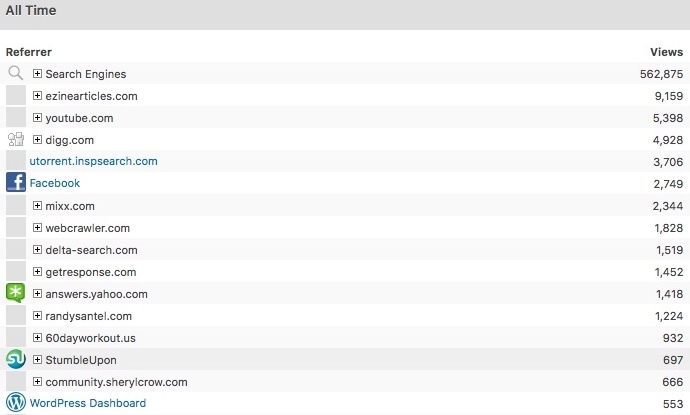 You’ll notice a number of my top posts are titled the same as my top keyword phrases. That was by design. Last but not least where the traffic came from. These are my top 16 out of 200+ places people came from before visiting my site. Clearly search engines was #1. Used to submit articles to EzineArticles.com which would send a couple of visitors every day for two or three years. Every video I’ve ever uploaded to YouTube included a link back to the post. Looks like it helped. Social Media didn’t really do that much over the years. Never shared that much on my Facebook profile. The Sheryl Crow does P90X post got a fair amount of traffic on its own and even more when somebody posted my link in the forum. Never thought WorkoutJourney.com would do as well as it did. Mostly because I started it as a journal of me using P90X back in 2008. Little did I know that Beachbody was spending over $100 million a year on advertising for P90X creating the demand. Turns out people like reading reviews and seeing results of real people. Not just what the company puts up. Thats how they found me. Searching in Google. The amount of searches every month in Google for just P90X and its related keywords was in the millions at the time. There was a lot of spillover from those people who did not go right to Beachbody.com. Funny thing at the time was I did not know about being a Beachbody Coach for the first six months of writing to WorkoutJourney.com. I was just learning about affiliate marketing and had Google Adsense ads along with product links to eBay on the site. Kept building other niche websites within the health and fitness field but none took like this one. My best guess is because I wrote a lot of unique and honest content. I had nothing new to write about. That’s it. There are only so many reviews of Beachbody products I can do. Plus, most of the Beachbody workouts they have come out with since Body Beast are really not for me. I would be doing the workout just to write a review. That’s not fun. I’ve also felt limited with the site. I am not a “fitness or health expert”. I have no interest in researching the micro nutrients of blueberries. That is the only possible direction left for me with that site. That does not interest me and there are hundreds of people who already do that. Had thought about selling the site but all of the content was about me. While I think I’m pretty cool I don’t know how much the content of me would be worth to someone else. $5…$10…$1? Is WorkoutJourney.com brand-able? Maybe. But I don’t see it as anything more than maybe a forum for people who workout (hundreds of those sites already) or a personal workout blog which is what it was. During the peak traffic years of the site I checked out one of those website valuation sites and it told me over $5000. Maybe. Maybe not. WorkoutJourney.com was making more than that in a month at that time through sales so I did not look into selling. But really the overall decision to shut down WorkoutJourney.com was to allow me to grow again. Health and fitness are a part of me. Not all of me. I have other interests besides working out and eating right that I want to write about. Plus, managing one site is a lot easier than two. Since I am Brad Gibala I might as well use my own name as a hub for everything I write online anyways. Should have done this from the get go. In the end all I’m really doing is moving the content to a new domain name. I’ve transferred all of the content here and 301’d the traffic from WorkoutJourney.com to BradGibala.com. That’s it. I would entertain the idea of selling the domain name WorkoutJourney.com and its content or just the domain name. If you’d like to talk more about buying it please contact me. Otherwise you can go through and check out my more popular posts or all of my posts.